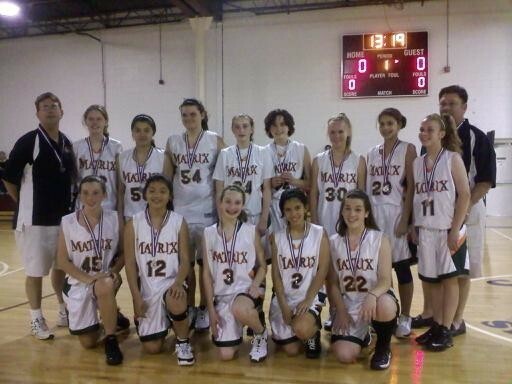 Congratulations to the Matrix 12U Black team, winners of the 2009 Potomac Valley AAU District Qualifying Tournament's 12-Under/7th Grade, Division II Silver Medal. On Saturday, Coach Michael Paul's Matrix 12U Black team came from 10 points down in the second half to top the tournament host and pool play winning Maryland United Lady Ballers by the final score of 46-44. In the finals on Sunday, the team fell 39-20 to the Potomac Pythons. Coach Teri Marrone's Matrix Green team just missed making it an all Matrix final as they lost a heartbreaker 39-37 to the Potomac Pythons in their semifinal. Then in the bronze medal game, they came up just short, falling to the Lady Ballers 48-32. Congratulations to both the Matrix 12U teams for their performance at Districts. Last updated: May 17, 2009.